More than eight out of 10 new cars registered in 2016 featured the latest digital radios, according to figures published by SMMT. Last year, 2.28 million cars hit the roads with the kit fitted as standard – the first time the 2 million milestone has been reached. Over the past five years, the number of newly registered cars factory fitted with digital radio has increased more than four-fold, thanks to major investment by manufacturers. In 2012, just over a quarter of new cars featured the systems as standard, compared with 84.5% in 2016. Motorists who opt for a car with DAB can now enjoy more than 400 digital radio stations. 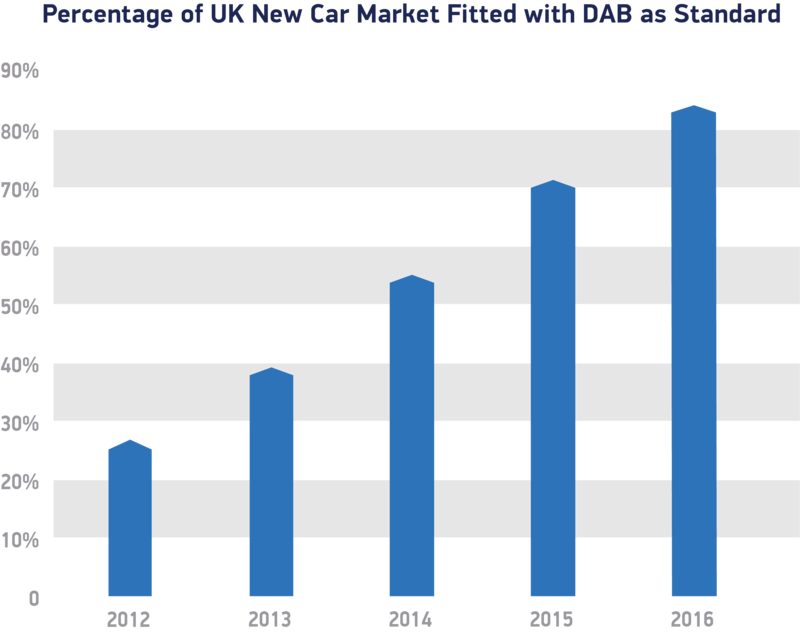 With increasing numbers of DAB-enabled vehicle models on the market, and new car registrations at record levels,2 more car owners than ever before are now able to tune into digital radio as they drive. While vehicle manufacturers have already shown they are committed to the digital revolution, the setting of a confirmed switch to digital date by government would considerably accelerate conversion of existing vehicles in use. This remains a sizeable job and, consequently, a significant opportunity for the aftermarket. Current share of all radio listening via digital platforms is 45.5%: RAJAR data, Q3 2016. A record 2,692,786 new cars were registered in the UK in 2016. This entry was posted in DAB and tagged co-star, DAB, DAB radio signal, digital radio, in-car entertainment, Mike Hawes, SMMT, UK Car Market on January 16, 2017 by Tim Cosgrove.